This Ancient symbol was carved into stone by the artisians of the Pictish Tribal culture. The primary function of this pattern was to ward off unseen negative forces. 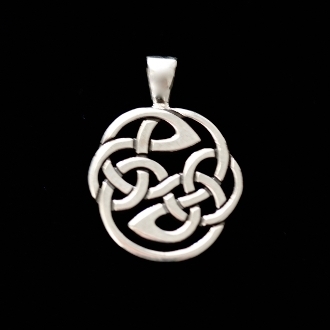 This design is crafted from a single knotwork strand, and is complete and whole within itself, and thus impervious to outside influence and forces. The ancestral origin of the "Picts" lie in the Northern Highlands of Scottland, though the symbolic beauty and use of the "Pictish school" of artwork was incorported into the Celtic Art styles of Ireland, Wales and beyond. I make 3 sizes of this design, this is the middle size. Around The size of a nickel.